We released 2 birds this morning and by this evening had admitted 3. That is kind of the way it goes. It is also the reason our census is so stable at anywhere between 13-18 Bald Eagles and about 75 other patients this time of year. That number soars in the summer months of course. 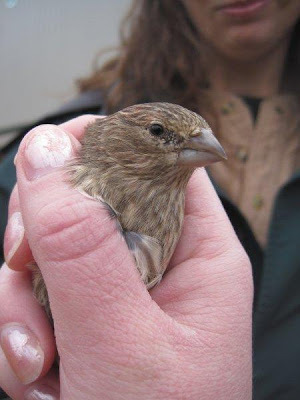 The House Finch below was a special case. She had serious conjunctivitis when brought in early February. Katie and Alberta and Lance and Aprill on weekend worked tirelessly to "prove me wrong" when I worried hers was not a case we could save. 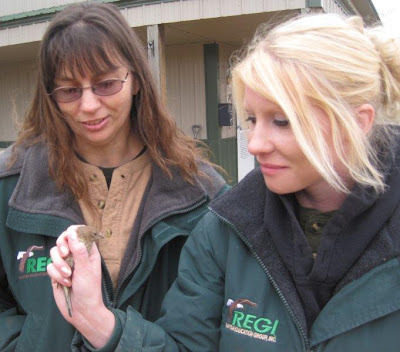 Yea for team REGI! 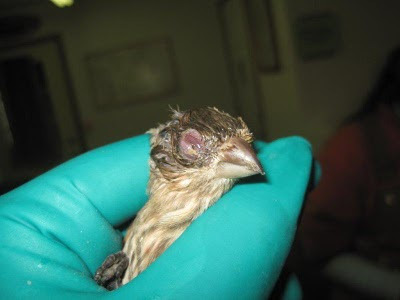 The House Finch was treated with ophthalmic antibiotics and her eyes were washed several times a day. To add to that regime, she was tube fed several times a day. This was necessary since she was unable to see and therefore eat or drink. You may wonder why she had to be fed so much. Birds require a huge amount of calories to live. They can eat their own weight or more each day in food. Kudos to everyone for this great work. 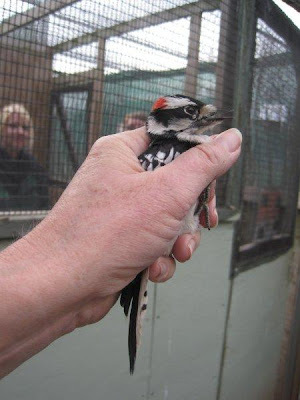 We also released a Downy Woodpecker that was admitted in early winter with a broken wing. It amazes me how many people don't think bird wings can be "repaired" once broken. The truth is they can, IF we get the into care early enough. That is one reason we are insistent that birds come into care quickly so the healing process has not already begun with the bone "out of place". Birds have to be perfect to survive in the wild. 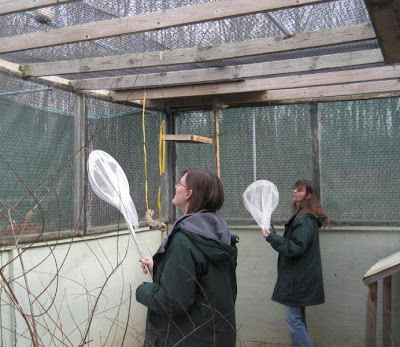 After the fracture heals the bird spend a month or more in an outdoor flight cage. This is to assure not only the bone is well healed but the muscles around that broken bone are back to 100% as well. In the wild there are many things that are important. Those include finding food, avoiding predators and attracting a mate. 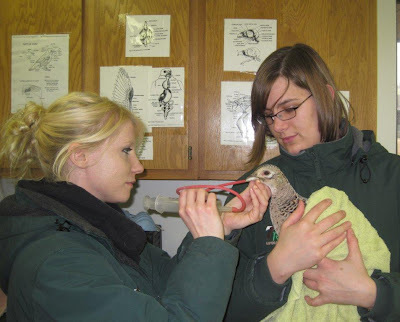 Our Ring-necked Pheasant admitted from Wausau on Monday continues to improve as far as her leg is concerned, but had a little back slide on her kidney function. Being hit by a several thousand pound car when you are a few pounds of bird is a harsh. All kinds of things to go wrong. For this pheasant, her kidneys are still healing. We monitor our patients closely so when she went into kidney failure, we were able to respond and give her oral fluid. She is doing great tonight. 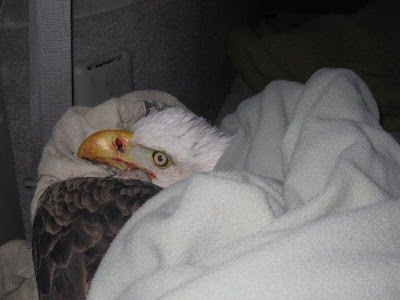 Speaking of tonight, I received a call from the Forest Country Sheriffs Department ,about a Bald Eagle by the side of the road. A citizen was waiting with her. We see both sides of people, the worst and the best. People that wait in the cold rain for hours until someone could be found to help, are absolutely the best. The person the hit her and didn't stop are not in that category. It will be a busy night as we fight to save her. More later.